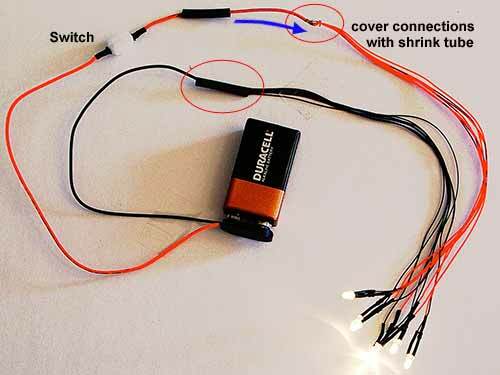 This is a nice easy way to run your 9 volt battery LEDs. 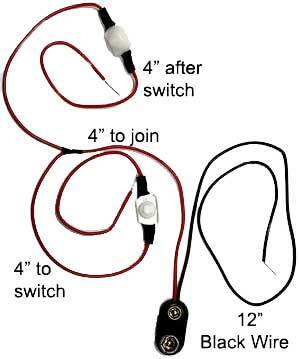 The 1 Amp switch is a push-on, push-off switch. We have pre-connected the switch and battery strap, nothing left to do but connect your choice of LED lights. Yes! It really is just that easy! Twist the red leads on your lights with the red lead on this 12 inch strap. Protect the connection with tape or shrink tube. Then twist the black leads on your LEDs to the black lead on this strap. Again protect the connection. Go! Snap on the strap to any 9V DC battery. Press the locking switch and have a light show! And you can connect A LOT of LEDs to this sturdy system. In our tests, 50 flashing LEDs shone nice and bright on a 9V battery for 4 1/2 hours. 3 LEDs were bright for 36 hours. If you are running less than 50 and more than 3, your run time per battery will be in the range. The battery snap/switch can handle solid and flashing LEDs. There is no carryover flash. Up to 50 LEDs flashing, solid or both can run on one 9 volt battery. See how easy this switch makes things! Strap: Black Lead 12" Red Lead 13"
If you need more control, consider the battery snap with TWO switches! 4 inches free after the switches.